If you don't find what you are looking for here, e-mail Sonny! 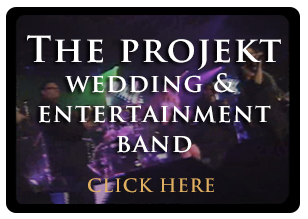 We have a large inventory available that is not yet posted! #919: King Louis XV "Vernis Martin" Style Steinway Model "A" Total Restoration (VIDEO) $150,000. #1020: Transparent Plexiglass Custom Sterling Baby Grand Art Case Piano $9500. #1021: Art Case George Steck, Walnut with Birds Eye Maple Floral Inlays Rebuilt/Refinished $4900. #879: Steinway L Grand Piano 5'10.5"Satin Ebony Finish, 1927 Refinished and partial rebuild 1999 $15,950. 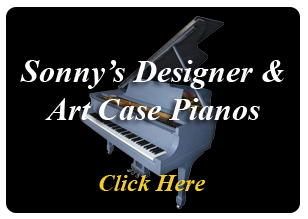 #931: Customized Art Case Pianos from Sonny's Design Your Own Custom Piano Steinway & other Brands available. #918: (SOLD) Steinway Grand Piano M Art Case Hand Painted Chinese Style Masterpiece Restored & Rebuilt New PianoDisc IQ Player System! 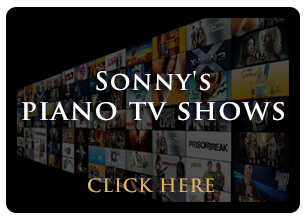 #908: Piano Player Systems:Sonny's Player Pianos Demo! 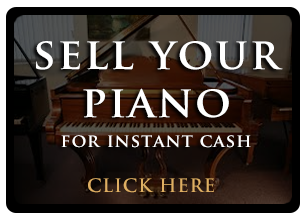 Install a PianoDisc IQ Player System into a Steinway or Art Case Piano Today! #991: (SOLD) Baldwin Model R 1987 5'8' Grand Piano, Beautiful Mahogany, Queen Ann style, Artist Series Pristine Blowout Sale! #896: (SOLD) Art Case Steinway M Chippendale Style, Gorgeous Mahogany, Reconditioned/ Refinished $15,500. #943: (SOLD) Luxury Piano, "Patine" Green, Art Case Upright by Baldwin with Hand Painted European Pastoral Love Scenes $1550. #948: (SOLD)Art Case La Petite Baby Grand 4'6" Walnut By Winter Piano Company Refin/Refurb. #795: (SOLD) Hand Painted Art Case Sohmer Grand Cupid Model Reblt./Refin. $9500. #809: (SOLD) Art Case Steinway Upright Piano Model F 42" Tall "French Walnut"
#849: SOLD Steinway B 6'10.5" Satin Ebony 1962 Total Rebuild/Refinish Highest Quality Parts & Craftsmanship! 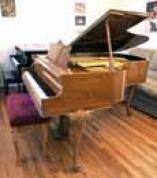 #802: SOLD Steinway L Grand Piano 5'10.5" 1982 (VIDEO) action parts just upgraded. #731: (SOLD)!!! Steinway M 1975 Ebony Black (VIDEO) Grand Piano. All original Steinway Factory finish and parts! #730: (SOLD-Congratulations Mike & Family) Art Case Steinway M King Louis XV 1940 (VIDEO) Steinway M Piano Rare Ebony Gloss all excellent condition original Steinway parts. 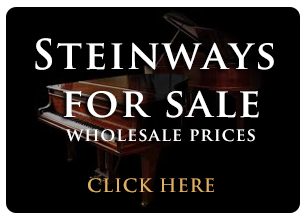 #541: Steinway M Grand Piano $10,500 (VIDEO) Ebony 1920 New Steinway Hammers all else excellent Original Parts. #463: (SOLD) Art Case Hardman Baby Grand "Hand Painted"
#441: Art Case Ebony Gloss Sterling Baby Grand Piano $4500. #439: (SOLD -Congratulations & Thank you Jerilyn) Art Case Hardman Baby Grand Piano Carved legs and decorative case. #384: (SOLD)Beautiful Art Case Ivers & Pond Grand Piano 5'8"
#383: Used & New Player Pianos For Sale Hi-Gloss Ebony & Mahogany starting at $7900. 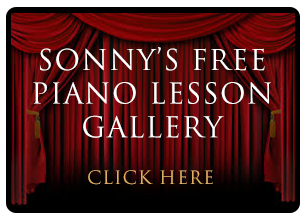 #377: First Place Prize For Sonny's 'Win A Free Piano' Contest Starting June 7th. New Albert Weber Upright 51 inches, Rosewood, $8500. #364: (SOLD CONGRATULATIONS DARLA )Art Case Knabe Baby Grand Piano, 1961, Pristine, Showroom Condition, Rich, sublime tone. #351: (SOLD)Art Case King Louie Harrington Baby Grand Piano, pretty walnut. HOLIDAY SPECIAL FREE DELIVERY! #245: (SOLD) Chippendale Art Case Young Chang Baby Grand Piano Like New! #243: (SOLD) Knabe Walnut Baby Grand Gorgeous Art Case 5'3"
#238: (SOLD Congratulations Carol & Bill) King Louie Art Case Hardman Baby Grand Piano 5' Gorgeous Mahogany Excellent! $4900. #224: (SOLD) Art Case Sohmer Baby Grand Walnut Pristine, Warranty! 1970 . FREE SHIPPING! #213: (SOLD Congratulations Doctor Bob) BECHSTEIN - Grand Piano 6'7" Art Case-Total Rebuild! #189: (SOLD Congratulations Mike & Family) Master Piece Art Case VOSE Baby Grand Piano Mediterranean Style-Collector's Item! #176: (SOLD) Art Case Knabe Baby Grand Pretty Walnut Queen Anne Leg 5'2"
#165: (SOLD Congratulations Julia & Dominic) Art Case Steinway Grand Piano Model B Just Totally Rebuilt New Everything! #149: (SOLD)Steinway Piano Console Art Case Walnut 42"
#142: "Piano Talks" Sonnys Replies To LA Times Article Saying Piano Is Losing Popularity! #128: (SOLD) Congratulations Lauren From Mom & Dad! Art Case Chickering Baby Grand Piano, Double Legs, Sonny Plays "Here Comes The Bride"
#122: (SOLD) Gorgeous Art Case Janssen Circassian Walnut Upright Player Piano $3900. #117: (SOLD) Congratulations Nick! Art Case Baby Grand Piano-Everett- Art Deco Excellent! 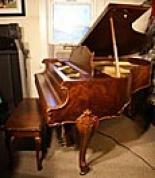 #104: (SOLD)"Tiger Wood" Rare African Mahogany Victorian Style Art Case Fischer Grand Piano Refin/Refurb - $8500. #91: (SOLD) Congratulations Aden! Art Case Mason & Hamlin Grand Piano Model A. Sonny Plays "Bach's Tocatta in D Minor"
#74: (SOLD) Congratulations Mike, Julie & Kids! 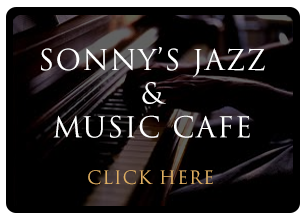 Art Case Hardman Baby Grand Cabriolet Legs (SEE VIDEO) Sonny Plays Bluesy D Minor Improvisation! #71: (SOLD) Baby Grand Piano Art Case Hand Painted Weber Sonny plays soulful rendition of "Caruso"
#64: (SOLD) Rare Art Case Rosewood Sohmer Baby Grand 1885, Sonny Plays "Under Paris Skies"
#55: Gorgeous Walnut Art Case Queen Anne Legs Kranich & Bach Baby Grand "Misty"
#53: Art Case Console Piano Marantz Mint Condition $1400. 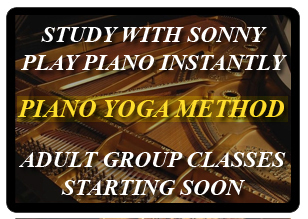 Sonny Plays "Yesterday Piano Improvisation"
#48: (SOLD)Kohler & Campbell Console Like New! 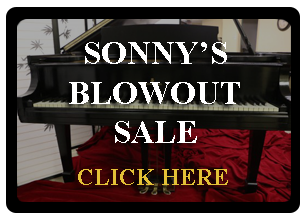 Sonny plays "Heart & Soul & Blue Moon"
#45: (SOLD)Art Case Baby Grand Piano 4' 7" Estey Gorgeous Walnut Just Refinshed Sonny Plays "Samba Improvisation"
#39: (SOLD) Pre-Owned Baldwin Baby Grand Piano 5'4" Mahogany $4500. "Improvisation Ala Carte"
#34: (SOLD)Rare Art Deco Mason & Hamlin Symmetrigrand Piano "Moon Dance"
#15: (SOLD)Knabe Baby Grand Art Deco Symetrigrand Reblt/Refin. (SEE VIDEO) $4900. #14: (SOLD)Art Case Knabe Baby Grand Piano 1973 Walnut $4900. - Free Shipping Before Christmas "Somewhere Over The Rainbow # 2"
#10: (SOLD)Art Case Baby Grand Piano Burled Walnut Hand Carved Vose 5' 1 Sonny Plays "That's All"
#9: (SOLD) Art Case Baby Grand Piano Burled Walnut Kranich & Bach - "Elevating Improvisation"
#8: (SOLD) Art Case Mason & Hamlin Baby Grand Model B - 5'4"
#877: Chinoserie Luxury Art Case Piano Steinway M " Hand Painted Masterpiece! Landscape Scenes & New PianoDisc IQ Player System! Completely Restored 2016 $125,000. #848: Luxury Art Case Steinway Model M Rare, Ornate Totally Rebuilt, Refinished & Restored "Hand Painted" Grand Piano $59,500. #920: Sonny's "Gemstones" Collection-Luxury Art Case Steinway Model M Rare, Ornate Case with Pearls and 14 karat brooches with rubies. Totally Rebuilt, Refinished & Restored "Hand Painted" $59,500. #924: Luxury Art Case Steinway M King Louis XV 1930 Refinished/Restored walnut $25,500. #921: Sonny's "Gemstones" Collection-Luxury Art Case Steinway Model M Rare, Ornate Case with Pearls and 14 karat brooches with rubies. Totally Rebuilt, Refinished & Restored "Hand Painted"
#945: Steinway M 5'7" 1932 Rebuilt /Refinished, New finish & Steinway Action Parts $25,500.